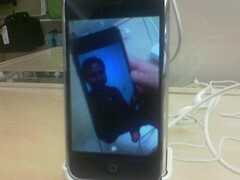 Here’s a photo of an iPhone showing a photo of an iPhone showing a photo of me. I had to take this meta-snapshot with my N6600 camera because the iPhone photo app lacks any visible bluetooth or infrared send capability, and sending email requires setting up an account. I tried signing into Flickr but all I got was a mess of timeouts, and anyway I’m not sure I would have been able to upload the photo through the Flickr form since I don’t know how local file browsing for photos would have worked. The multi-touch interface is wonderful, but touchscreen keyboard input is a nightmare, and AT&T’s data transfer speeds are a disgrace. iPhone, C+. Update: I just realized the iPhone has wifi too, so the timeouts might have been from a bandwidth bottleneck at the Apple Store’s network. Still, boo. I love having a blog because I can write a big long rant and then post the link to places that I would normally copy and paste it into.